Esok 6 Jun planet Zurah atau Venus akan melintasi antara bumi dan matahari bermula jam 6:30 pagi. Kemuncaknya adalah pada jam 9: 30 pagi dan akan tamat pada jam 12:30 tengahari. Pada ketika itu kita akan nampak satu titik hitam melintasi matahari seperti dalam gambar yang telah perlaku pada tahun 2004. One of the rarest astronomical events occurs on Tuesday and Wednesday when the planet Venus passes directly between the Sun and Earth, a transit that won't occur again until 2117. 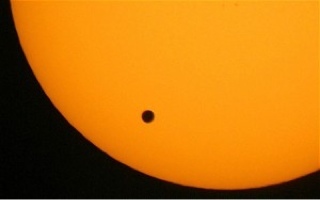 “The Venus transit really brings home to us, in a unique way, how ordinary our sun is. It's just another star," said scientist and author Mark Anderson. "There's something very humbling out of this experience. We are another planet in orbit around another star in another galaxy in another corner of the universe. It really brings it home to us," Mr Anderson said. Tuesday's transit, which bookends a 2004-2012 pair, begins at 6:09pm EDT (2209 GMT) and lasts for six hours and 40 minutes. Times can vary by seven minutes depending on the location of the observer. Skywatchers on seven continents, including Antarctica, will be able to see all or part of the Venus transit, which should only be observed with telescopes outfitted with solar filters to protect the eyes. The internet will be a hub of activity, with live video and pictures from an armada of space- and ground-based observatories. Even astronauts aboard the International Space Station are joining in the event. It's not all about pretty pictures. Several science experiments are planned, including studies that should help in the search for habitable planets beyond Earth. Telescopes, such as NASA's Kepler space telescope, are being used to find so-called extra solar planets that pass in front of their parent stars, much like Venus will pass by the sun. During the transit, astronomers will be able to measure Venus' thick atmosphere and use the data to develop techniques for measuring atmospheres around other planets. Studies of Venus' atmosphere also could shed light on why Earth and Venus, which are almost exactly the same size and orbit approximately the same distance from the sun, ended up so different. Venus has a chokingly dense atmosphere 100 times thicker than Earth's that is mostly carbon dioxide, a greenhouse gas that heats up Venus' surface to a lead-melting 900 degrees Fahrenheit (482 degrees Celsius). The weather is brutal, with towering clouds of sulphuric acid that jet around the planet at 220mph, regularly dousing the planet with acid rain. “A human being transported to this hellish environment would be crushed, suffocate, desiccate, and possibly ignite," wrote Tony Phillips, with Science@NASA. Tuesday's transit is only the eighth since the invention of the telescope, and it will be the last one until December 10-11, 2117. It also is the first to take place with a spacecraft at Venus. Observations from Europe's Venus Express probe will be compared with those made by several ground and space-based telescopes including Nasa's Solar Dynamics Observatory, the joint U.S.-European Solar and Heliospheric Observatory and Japan's Hinode spacecraft. Slooh Space Camera will broadcast 10 real-time feeds of the transit from solar telescopes located in Australia, Japan, New Zealand, Hawaii, Norway, Arizona, and New Mexico. The webcast at http://events.slooh.com/ begins at 6pm. EDT (2200 GMT).